Companies like Amazon, Vanguard, Cleveland Clinics, and Intel, are Flywheel examples in Jim Collins’ Turning the Flywheel: A Monograph to Accompany Good to Great. These companies achieve success by identifying their flywheel. Apply understanding with creativity and discipline, and your flywheel yields the power of strategic compounding. Each turn builds upon previous work as you make a series of good decisions, supremely well executed, that compound one upon another. This is how you build greatness. In “What’s Your Flywheel?” we shared Amazon’s Flywheel and how they used it to achieve success. In Turning the Flywheel: A Monograph to Accompany Good to Great, Jim Collins shares six steps to create/identify your flywheel. With each company’s example, Collins shares a narrative of their flywheel. 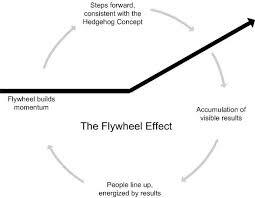 Your flywheel, when properly conceived and executed, creates both continuity and change. Collins emphasizes you need to stay with a flywheel long enough to get its full compounding effect. And, to keep the flywheel spinning, you need to continually renew, and improve each and every component. Don’t become seduced by an endless search for the Next Big Thing. To achieve success, requires understanding the underlying architecture of the flywheel. Ware Elementary School, Fort Riley Army base, Kansas, was one of the first Kansas public schools put “on improvement” for poor performance. Only one-third of students hit their grade level in reading. Principal Deb Gustafson struggled with a high student-mobility rate and a 35-percent teacher-mobility rate. Children faced a special type of adversity, the stressful life of military families in wartime. Gustafson realized if the school failed them at first grade or second grade, they maybe failing them for the rest of their lives. Gustafson had read Good to Great for the Social Sector and fell in love with the Flywheel concept. Flywheel step 1: Select teachers infused with passion. “We could not easily attract experienced teachers to teaching on a military base in rural Kansas,” explained Gustafson. “So, I focused on passionate potential, even if inexperienced, figuring that people with the right values and irrepressible enthusiasm could be harnessed and shaped into effective teachers.” (Is this a recruiting idea for your business?) This passionate energy got the flywheel going. It had to be guided, channeled, and harnessed. Flywheel step 2: Build collaborative improvement teams. Each teacher joins a team led by an experienced Ware teacher who exemplifies the culture. Once a week, teachers come together to share ideas, get feedback, discuss individual student progress, and improve the Ware teaching recipes. Flywheel step 3: Assess student progress, early and often. Streams of data, shared and discussed in teams, generate energy. Teachers and teams set goals and craft specific plans to help children who might be falling behind. 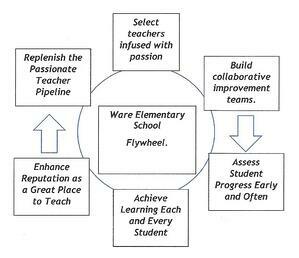 Momentum increases as teams met quarterly with school leaders to refine student plans and keep the flywheel spinning. Flywheel step 5: Enhance the school’s reputation, not just for results but also as a great place to teach. Get your flywheel right, then you must continually ask, What do we need to do better to accelerate momentum? Your flywheel depends upon getting the sequence right. Every component depends on all the other components. They’re interdependent. If one component is at a 3 and the rest of your components are at an 8 or a 10, you need to build the lowest component up to the level of your others. How do you create your Flywheel? Collins 6 steps next blog. To build an enduring great organization you need disciplined people engaged in disciplined thought to take disciplined action to produce superior results to make a distinctive impact in the world. Positioning Systems is obsessively driven to elevate your teams Discipline. A winning habit starts with 3 Strategic Disciplines: Priority, Metrics and Meeting Rhythms. Your business dramatically improves forecasting, accountability, individual, and team performance. Creating Execution Excellence demands creating/defining, understanding, with creativity and DISCIPLINE your Flywheel. 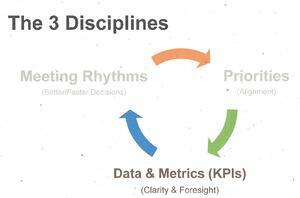 Meeting Rhythms achieve a disciplined focus on performance metrics to drive growth. Positioning Systems helps mid-sized ($5M - $250M) business Scale-UP. We align your business to focus on Your One Thing! 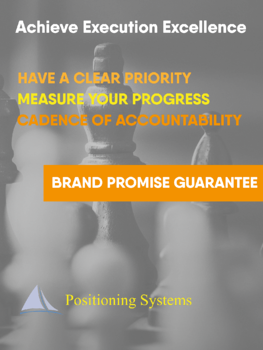 Contact dwick@positioningsystems.com to Scale Up your business! 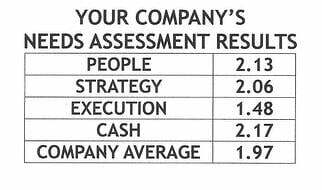 Take our Four Decisions Needs Assessment to discover how your business measures against other Scaled Up companies. We’ll contact you. Collins’ Turning the Flywheel: A Monograph to Accompany Good to Great is a short book. just 41 pages. One section is devoted to how to create your flywheel. I’ll share this and how I constructed a flywheel for one of my former customers with Collins instructions, next blog.